How is your new year resolution going? I wanted to share this video I have shared with everyone via email this month, “Welcoming 2011 – I am so ready for a new year!” I moved to Better Homes and Garden Real Estate Executive three months ago in large part because of the great marketing tools this company provides. Enjoy “Make a Resolution You Can Keep”. If your home already has good insulation and efficient windows and doors, alternative energy may be the way to go. Natural Home Magazine has more information. I am working with a buyer who is looking at homes in the under $150k price bracket. Three years ago this would mean a nice tent somewhere. Now you can actually buy big homes on land in this price range in Seattle. Wow what a difference a recession and real estate bubble make. The borrower gets just one mortgage loan, at a long-term fixed (or adjustable) rate, to finance both the acquisition and the rehabilitation of the property. To provide funds for the rehabilitation, the mortgage amount is based on the projected value of the property with the work completed, taking into account the cost of the work. Expenses eligible to be included in the cost of rehabilitation are materials, labor, contingency reserve, overhead and construction profit, up to six (6) months of mortgage payments, plus expenses related to the rehabilitation such as permits, fees, inspection fees by a qualified home inspector, licenses and consultant and/or architectural/engineering fees. The cost of rehabilitation may also include the supplemental origination fee which the mortgagor is permitted to pay when the mortgage involves insurance of advances, and the discounts which the mortgagor will pay on that portion of the mortgage proceeds allocated to the rehabilitation. Luxury items and improvements are not eligible as a cost rehabilitation. However, the homeowner can use the 203(k) program to finance such items as painting, room additions, decks and other items even if the home does not need any other improvements. All health, safety and energy conservation items must be addressed prior to completing general home improvements. (1) Addition to existing structure. New construction must conform with local codes and HUD Minimum Property Standards in 24 CFR 200.926d. a) Weatherstrip all doors and windows to reduce infiltration of air when existing weatherstripping is inadequate or nonexistent. I can recommend very experienced professionals in the mortgage industry who can talk details with you for your specific purchase scenario. As a green housing expert I view the 203(k) as the single most important tool in turning around our housing market. There are a lot of older home just sitting there empty – some for over a year – and there should be people living in these structures and enjoying their lives in a healthy home. Just contact me with your questions about making your home more green or finding a healthy home to live in (even if you have to make it green yourself or hire someone to do it for you). President Obama made the development of cleaner energy a central tenet of his State of the Union speech Tuesday night, a theme he also had stressed in his 2010 address to Congress and the nation. This time, after a year in which more than 50 solar-related companies announced plans to establish or expand manufacturing facilities, the topic drew more bipartisan applause. The president said that a “new goal” will be for the nation to generate 80 percent of its electricity from clean energy sources by 2035. That figure includes generation from cleaner coal plants, nuclear plants and natural gas, as well as from renewable sources, he said. The country already gets about 55 percent of electricity from natural gas, nuclear, hydroelectric and renewable sources. “Clean coal” is still in the development and demonstration stage. As in 2009, Mr. Obama again referred to the competition the United States faces from other countries in advancing solar and other renewable sources of energy as nations vie to gain an edge. Since the start of the Industrial Revolution, development of energy sources for mass use has been the backbone of societal advancement and allowed first Great Britain and then the United States to attain world leadership roles. Echoing recent remarks by Secretary of Energy Steven Chu, the president spoke of the present as “our Sputnik moment,” a reference to the shock and awe that were felt across the country when the Soviet Union in 1957 launched a satellite into space that overflew the United States, engendering fear that the communist country had developed technological capabilities that the United States could not match. “But after investing in better research and education, we didn’t just surpass the Soviets; we unleashed a wave of innovation that created new industries and millions of new jobs,” the president said. He said he will propose a budget within a few weeks that will seek to reinvigorate U.S. research and development. “We’ll invest in biomedical research, information technology, and especially clean energy technology – an investment that will strengthen our security, protect our planet, and create countless new jobs for our people,” Mr. Obama said. “Already, we are seeing the promise of renewable energy,” he added. “Robert and Gary Allen are brothers who run a small Michigan roofing company. After September 11th, they volunteered their best roofers to help repair the Pentagon. But half of their factory went unused, and the recession hit them hard. “That’s what Americans have done for over 200 years: reinvented ourselves. And to spur on more success stories like the Allen brothers, we’ve begun to reinvent our energy policy. We’re not just handing out money. We’re issuing a challenge. We’re telling America’s scientists and engineers that if they assemble teams of the best minds in their fields, and focus on the hardest problems in clean energy, we’ll fund the Apollo Projects of our time. “At the California Institute of Technology, they’re developing a way to turn sunlight and water into fuel for our cars. At Oak Ridge National Laboratory, they’re using supercomputers to get a lot more power out of our nuclear facilities. With more research and incentives, we can break our dependence on oil with biofuels, and become the first country to have 1 million electric vehicles on the road by 2015. Solar photovoltaic installation companies have recently complained that thickets of widely varying local permit regulations are slowing adoption of PV by home and business owners, and other industry representatives have said the United States is in dire need of a coherent national energy policy. China, Germany, Japan, Italy and other countries have successfully spurred solar development in the past few years, while the United States has lagged. China has established the capacity to churn out millions of solar panels annually. In the last quarter of 2010, federal and state officials in California and Nevada approved new solar power plant projects that if built will begin to move solar electricity into the mainstream as an electricity source in the Southwest. The Solar Energy Industries Association said nearly 100,000 Americans now work in solar-related jobs. Take a few minutes to read Earth Advantage Institute’s prediction for this year’s building trends. Since 1 in 4 homes built in Seattle or Portland earn Environmental Certification of some kind (there are various programs available), as a new home buyer you will start seeing the label more and more and you should have some information in order to make an informed buying decision. The trends, which range from “affordable green” to lifecycle analysis of materials, were identified by Earth Advantage Institute based on discussions with a range of audiences over the latter part of 2010. These sectors include policymakers, builders, developers, architects, real estate brokers, appraisers, lenders, and homeowners. Natural Home mag has gone thru a redesign and I am impressed. Learn all of the basic green home concepts just by reading the current issue, Jan/Feb 2011. Energy efficiency, water conservation, home heating and cooling, and landscaping all are addressed just in the first half of the mag. Passive solar basics, cheap ways to save energy, payback times on different alternative energy systems, and even ways to make your home office have a lighter footprint. There are more articles in the Garden, Food, Health, and Lifestyle categories. Affordable subscription at $21, cheap education here! 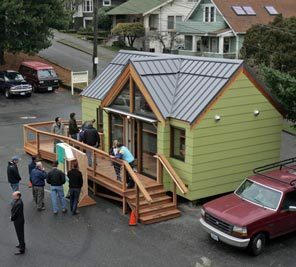 Photo: GREG GILBERT / THE SEATTLE TIMES Caption: An exterior view of the energy-efficient modular residence, also known as the "Mini-B," in the lower parking lot of Phinney Neighborhood Association Center. The house will be there for a few months. They may have closed the Phinney Ridge Farmers Market, but at least the parking lot of the Phinney Neighborhood Association will still be put to good use. This little home built using PassivHouse design ideals was built by students at the Georgetown campus of South Seattle Community College. I happened to tour the little house in August when I took my Earth Advantage Broker training on campus there…. It was still under construction and I admired their handiwork! You should check this out. In the neighborhood of High Point construction of new homes has begun (finally). In just one week shells for the models have gone up. As I walked thru the site this morning I noticed that a block with pervious concrete has been protected from getting dirt into the cracks while workers are onsite. Here I will show you how both a sidewalk and a bioswale and a construction site all have protection in place to keep damage from occurring. In this video I spotlight a functioning bioswale located in the Built Green Certified community of High Point, located in West Seattle, WA. Bioswales are dry features planted with drought-tolerant plants that can survive short periods of flooding. Bioswales are used in master planned communities to manage large flows of runoff caused by so much man-made surface taking up what used to be soil that could absorb rain.